If you did any baking during the holidays, you learned (or relearned) that scaleup involves more than multiplying ingredient quantities, container sizes, and cooking times. As with adjustments to baking recipes, so it is with more complicated scaleup projects—such as those encountered in bioprocessing. High cell densities can overburden the usual cell harvesting approach, depth filtration. Although alternatives to traditional depth filtration are being investigated, none are yet ready for prime time, notes Galliher. GEN has previously reported on two attractive alternatives: Pall’s acoustic wave separation and Repligen’s alternating tangential filtration (ATF). Acoustic wave separation uses sound to coagulate cells, causing them to fall from suspension. Pall has demonstrated a 75% reduction in post-separation filter footprint (as with centrifugation, unfortunately, still necessary) and reduced usage of buffers and water for injection. Similarly, ATF operated in a concentrated fed-batch mode is an attractive alternative to depth filtration or centrifugation in that it produces cell-free permeate. Continuous operation is also possible but adds complexity and validation burden. Centrifugation is a traditional process that removes most cells but still requires some filtration as the centrate is not totally cell free. Single-use centrifuges, however, have lower throughput compared with stainless-steel systems. The Allegro STR stirred-tank bioreactors from Pall Life Sciences are next-generation systems that simplify maintenance and enable scalable cell culture performance. 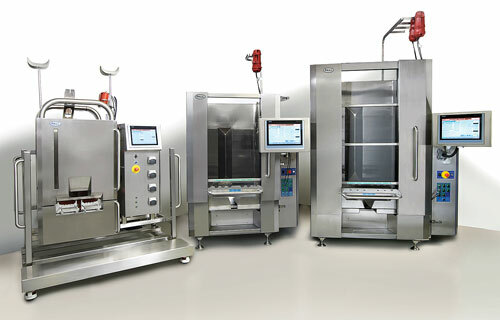 All product contact surfaces are single-use components, and working volumes range from 60 L to 2,000 L. In this image, 200 L, 1,000 L, and 2,000 L Allegro STR bioreactors are shown from left to right. Maintaining product quality through scaleup is challenging as several parameters change, including equipment and components used to manufacture the product. Annelies Onraedt, Ph.D., director of marketing for cell culture technologies at Pall Life Sciences, provides the example of bench-scale processes often using peristaltic pumps, where at higher flow rates other pumps are specified to maintain quality under different conditions of shear stress on cells and proteins. Whereas some downstream operations, such as tangential flow filtration, are nominally scalable, bioreactor scaleup requires deep understanding of the multiple parameters affecting the oxygen uptake rate. “There are general rules, like keeping the impeller tip speed constant,” says Dr. Onraedt, but smooth scaleup demands deep process understanding. Another example of components affecting scaleup is the availability of single-use sensors that measure pH and dissolved oxygen. During cell culture, these sensors are typically optical devices with limited ability to undergo gamma irradiation. Higher radiation doses employed for scaled-up systems limit the use of these sensors in large single-use bioreactors. On the subject of process changes to accommodate changing requirements at various scales, Dr. Onraedt notes that significant alterations are never welcome, even though they are necessary in many cases. Employing one large-volume single-use bioreactor across several scales is highly desirable but not always achievable. Practical working volumes depend on the system’s turndown ratio—the quotient of total volume and working volume. Thus, a single-use bag with a turndown ratio of 5:1 allows operation of a 100 L single-use biorector bag at just 20 L, providing the culture with “room to grow” without changing bioreactor bags. Mixing and sparging are the main limitations to high turndown ratios, notes Surendra Balekai, product manager, Thermo Fisher Scientific: “In lower-volume operations, bottom-driven and top-driven mixing both claim advantages, such as the ability to grow seed cultures at small scale and ramp up from there.” Thermo Fisher uses top-driven mixing whereas most other vendors to the bioprocessing industry use bottom-driven mixing. During an investigation into mixing techniques, Thermo Fisher scientists noted the significance of headspace in the turndown ratio calculation. Simply put, sparging the metabolic gases accumulated from headspace becomes more significant at higher turndown because the gas volume impact on cell culture is much greater at 80 L than at 40 L working volume. Given the cost of acquiring and disposing of single-use bioreactors, the economic drivers for cross-flow sparging can be substantial. “Operating at higher turndown reduces the number of bioreactors you need to go from seed to medium production scales, even up to 2,000 L systems, depending on seeding ratio,” explains Balekai. Conventional scaleup requires separate bags for several intermediate scales. “If you eliminate just one bioreactor during scaleup, you’re saving significantly on operational expenses,” insists Balekai, “not to mention maintenance capital investment, floor space in clean areas, and maintenance.” Cross-flow sparging, a patented technology, is undergoing alpha testing at several Thermo Fisher customer sites. Volumetric capacity improvements through process intensification is one goal of efficient scaleup—the ultimate “economy of scale.” According to Ken Clapp, senior manager for applications, technology, and integration at GE Healthcare Life Sciences, the competitive aspects of intensification arise from improved process economics or business models. 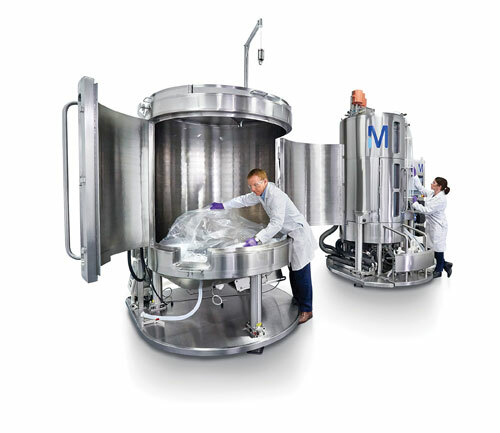 Clapp offers as an example a bulk perfusion cell culture process with a vessel volume or more per day of fresh media input and waste media output. The scaling up of a properly intensified analogous process, one that eliminates the bulk media dependence in favor of smaller volume of specific media constituents, is facilitated through the selective use of single-use components and systems. ReadyToProcess Hollow Fiber Cartridge from GE Healthcare in use. Moreover, as bioprocessors deploy single-use technology at different scales, from bench to 2,000 L and beyond, they must devise strategies for managing equipment and consumables. Such strategies address the storage and installation of disposable bags and the decontamination of consumables after their (single) use, as well as disposal itself. Both decontamination and disposal are more cumbersome if they follow the processing of highly potent molecules. Another mixed blessing occurs in process modeling, which increasingly relies on smaller and smaller scaling tools for screening cells, media, feeds, and process conditions. Process modeling techniques may shorten development times and reduce the mass of protein required for process development, but during scaleup they can lead to greater scaleup factors and hence uncertainty. As inter-plant technology transfer becomes more and more the norm, porting a process to another country or regulatory jurisdiction without adequate process knowledge becomes quite risky. “What you know about your process affects how smoothly technology transfer will go,” comments Dr. Kools. With so many processes going global in terms of patients and markets, having insight into various regulatory landscapes will facilitate efficient process transfer. On the matter of process changes to support technology transfer, Dr. Kools notes that “with the right quality programs from vendors that take into account global regulations, you will have greater peace of mind when a process changes geography or is produced for a different country.” He adds that MilliporeSigma spends a lot of time assuring that it “has the right product, with the right level of information,” so site changes can be managed in a more straightforward manner regardless of where the product is made. 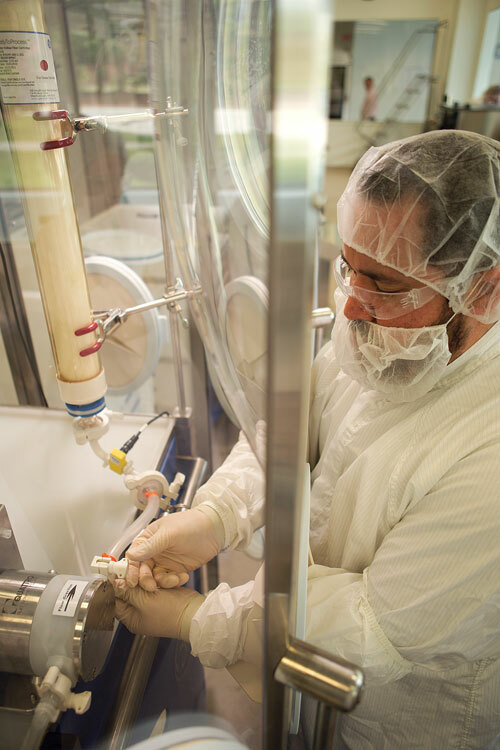 As quality-by-design is implemented more widely, bioprocessors increasingly work within a design space. Changes occurring within that design space during scaleup or technology transfer proceed much more easily. A MilliporeSigma scientist installs a single-use bag into the company’s Mobius Power MIX 2000 single-use mixing system, which provides working volumes from 300 L to 2,000 L. The mixing system builds on MilliporeSigma’s portfolio of Mobius single-use solutions for upstream and downstream processing. The objective of scheduling during scaleup is to obtain a good estimate of the production rate—the number of batches a facility can reasonably produce within a given time period. While scaleup usually focuses on unit operations such as cell culture, there is much more to consider. Another way to view scheduling is to understand better the true constraints with respect to timing, and thereby predict productivity at larger scale. Duration of operations is infrequently linear with scale. “Cell culture lengths of time often change during scaleup, sometimes to longer and sometimes to shorter culture times,” says Charles Siletti, Ph.D., a principal at process modeling firm Intelligen. Multiproduct facilities do not present any special scheduling concerns. “The suites are normally separated and do not share equipment without shutdown and cleanout between campaigns,” Dr. Siletti elaborates. Theoretically then, one could fit the available time and resources for two or more products sequentially. Similarly, the need for pure water, which is used in large quantities for cleaning, might affect the decision to use stainless-steel or single-use equipment. These devices trigger their own scale-dependent resource requirements. An often-overlooked scaleup issue involves manpower. “Small-scale and larger facilities utilize human resources differently,” Siletti notes. The former often operate in discrete shifts of one or two per day; the latter operate 24/7. “Scheduling will help with manpower allocation as well,” Dr. Siletti advises.